If you ever find yourself unmotivated to stick to a weight loss plan, simply spend the morning shopping for clothes. It’s cruel and unusual punishment but it does the trick every time. You think you’re a size x but in reality you’re a size XXXXXXXXXX. Awesome. 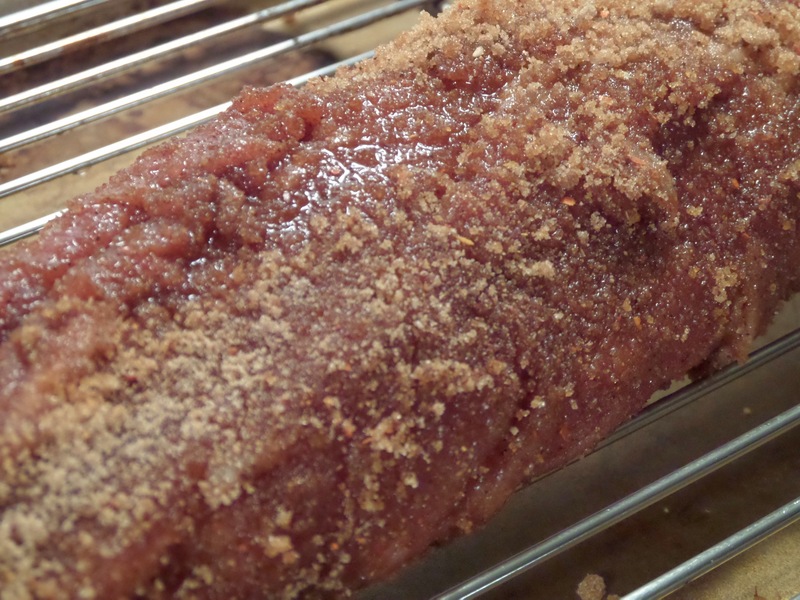 Enter the infamous pork tenderloin…. This is a recipe from Cooking Light called Chinese Barbecued Pork. The name is misleading because it’s not barbecued and unlike Chinese spareribs or anything you may find in an American-ized Chinese restaurant, it’s really healthy (165 calories)! 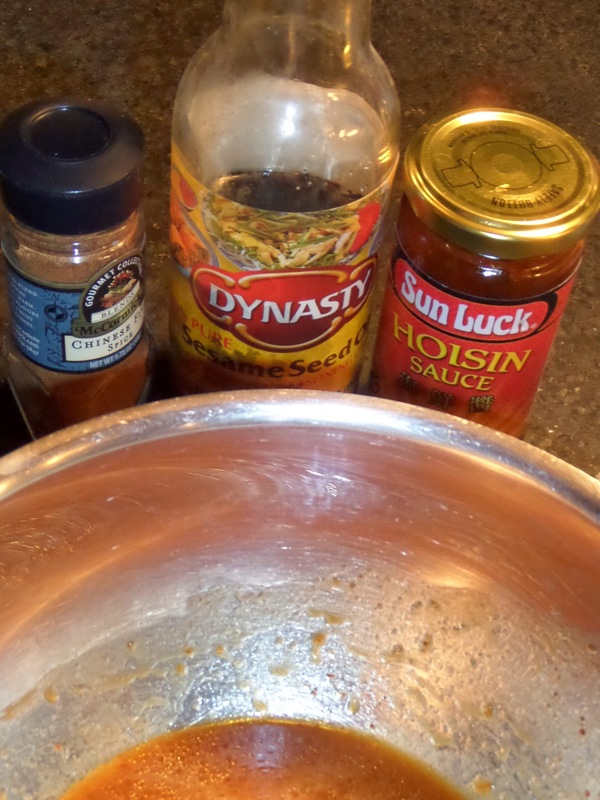 A few simple ingredients: Hoison sauce, five-spice powder, sesame oil, orange juice, brown sugar and red pepper flakes. I really liked the cooking method….none of the usual 350 for 35 minutes. Nope, not this time. This is a 400 degree job and so the brown sugar, five-spice and red pepper flakes turn into a really nice crust. 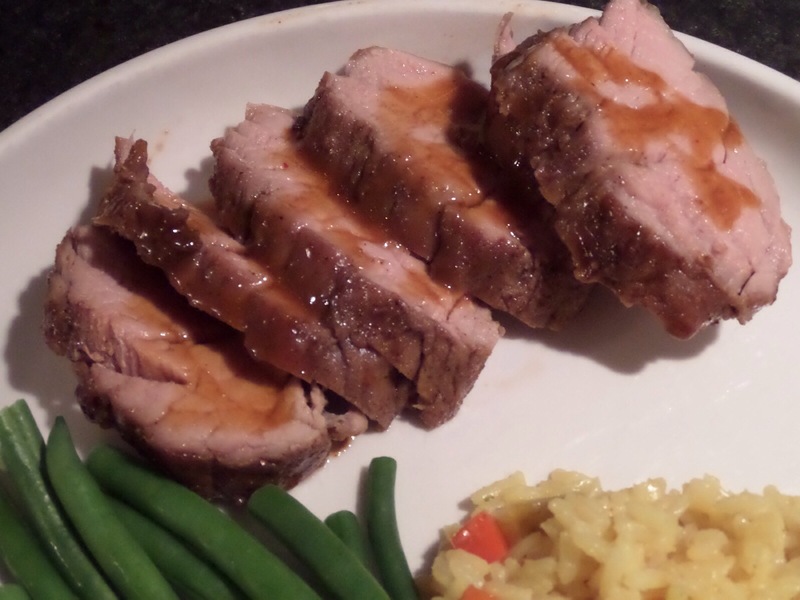 I doubled the sauce and set some aside so I could drizzle a little over the finished pork. And here’s how to prepare this yuminess…. Trim fat from pork. Combine sugar and next 3 ingredients (sugar through pepper). Rub pork with spice mixture. Place pork on a broiler pan coated with cooking spray; insert a meat thermometer into thickest portion of tenderloin. Bake at 400° for 10 minutes. 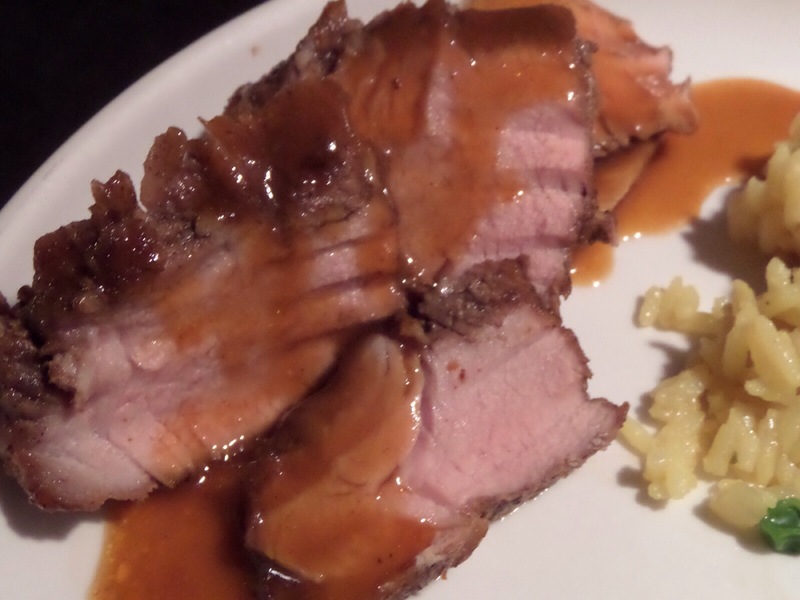 Combine hoisin, orange juice, and oil in a small bowl; brush over tenderloin. Bake for an additional 15 minutes or until thermometer registers 160° (slightly pink). For a 1lb tenderloin, this was the perfect cooking time. I don’t know about you but I can only find tenderloins in the 1.25 – 1.5 lb range so I did increase the cooking time by 7-8 minutes and it was perfect. Now that’s a damn tasty 165 calories!